The children are expected to be punctual and in the line with their classmates each morning. 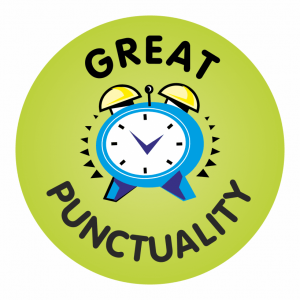 It is so important for children to understand the importance of being punctual. Even missing a few minutes each day can add up to many hours over the school year. In St Audoen’s we track Punctuality as closely as Attendance and all students are signed in and out by our HSCL Teacher. We also ask that you are on time picking up your child daily. Small children can become very upset and anxious if they are left waiting when every other child has been collected. We start school at 8.50am! You show respect for the person you are meeting. You respect yourself enough to keep your word. You prove that you can be trustworthy. You are appreciated for being on time. You are regarded as a reliable person. You are seen as a professional. You build a strong reputation for your character. You attract more opportunities to yourself. You eliminate stress from your life by removing the anxiety of being late. You do the right thing and feel good about it.